CAMP COURTNEY, Okinawa, Japan — In a test of brute strength, 31 competitors pressed their limits in the Annual Marine Corps Community Services Semper Fit Powerlifting Competition aboard Camp Courtney Jan 10. The competition lifted off with a weigh-in of each powerlifter to determine which weight class each athlete would compete in for the title of Weight Class Champion. The competition consisted of seven classes for males and three for female. The event was comprised of three events: the squat, bench press and deadlift. 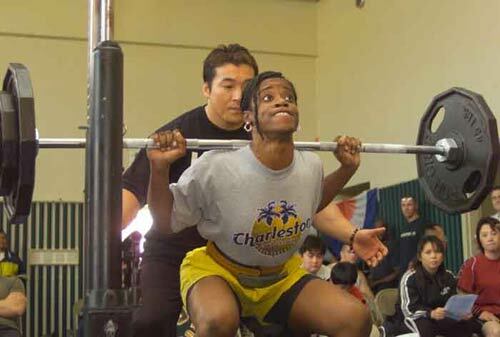 During the competition, athletes were allowed three attempts at each event, and then their lift scores were combined for their final score. The lifter with the highest total was named winner. In the squat event, a bar with a predetermined amount of weight rested upon the lifter's shoulders with their knees locked out. The lifter then squatted to make his thighs parallel to the ground, then pushed the weight back up. Once the lifters had locked their knees out, the attempt was complete. In the bench press, competitors laid on their backs on a bench with their feet planted firmly on the ground. The lifters then held the barbell at arms-length above the chest, then lowered it to chest level. The bar was then pushed back up until the competitors' elbows were locked out. In the final event, the deadlift, the competitors gripped the barbell, which was on the floor, then attempted to lift the weight using their back and thigh muscles until they were standing upright with their shoulders drawn back. "In an event like this, we get to see the overall weightlifter," said B.K. Price, recreational assistant sports coordinator, Camp Courtney Ironworks Gym. 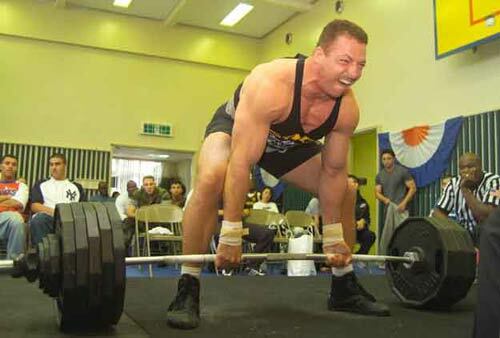 "Many times there are only single events, like bench press competitions." This year brought three female competitors, Yuko Nagama, Akemi Toguchi and Veronica Finney. These women competed fiercely to the end for the title of Overall Champion. Finney earned the title with a total score of 550 pounds. The fourth grade elementary school teacher lifted 200 pounds in the squat, 125 pounds in the bench press and 225 pounds in the deadlift. "I workout everyday, but I haven't competed for four years, so this was fun," said Finney. "I didn't take it that serious. It was just to get me back in the swing of things. I was really excited and happy when I found out I was overall champion." In the men's competition, Shawn Alderman won the 133-148 pound weight class with a score of 1,060 pounds. 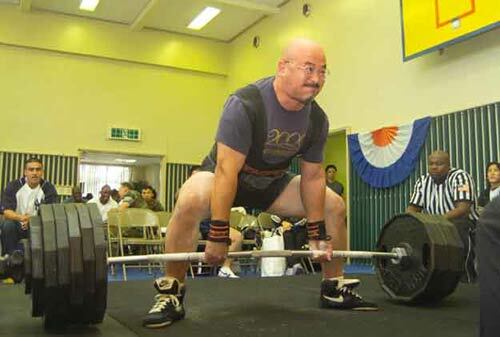 Nobumasa Higashikuroshima edged out his competitors in the 149-165 pound weight class with a final score of 1,130 pounds. With 1,165 pounds, Mike Morris finished first in the 166-181 pound weight class, and Naokazu Yogi won the 182-198 pound class with a final score of 1,040 pounds. Jack Hamilton won the 243-275 pound weight class with 1,400 pounds. The overall champion and winner of the men's 199-220 pound weight class was Eishin Hiyajyo with a final score of 1,550. Timothy Andrews was close behind and won the 221-242 pound weight class with 1,515 pounds. "The event was a great time for everyone," said Price. "They were all pulling for each other and they're all friends, which pushed them to do more and more."